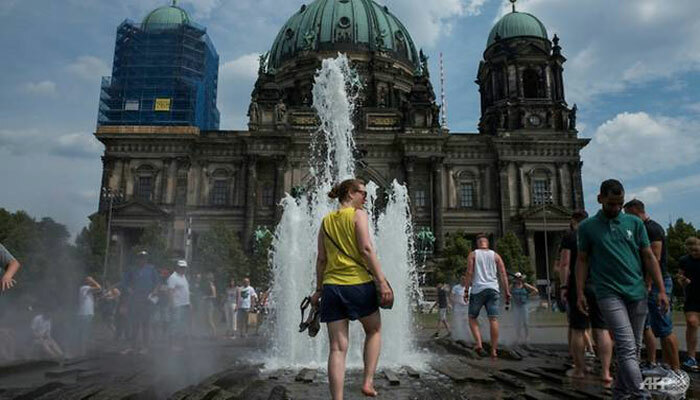 MADRID: Europe sweltered through an intense heatwave on Sunday, with soaring temperatures contributing to forest fires, the closure of nuclear plants closing and even a threat to the Netherlands´ supply of potato fries, although some countries experienced a slight respite. A top temperature of 42 degrees Celsius (107 degrees Fahrenheit) was forecast in the southwest region of Extremadura on Sunday, where a wildfire in San Vicente de Alcantara has been brought under control by firefighters, the local fire service said. The mercury had reached 44 C in the country´s south on Saturday, the Spanish Meteorological Agency said. The mercury was expected to hit 45 C in some parts of Portugal on Sunday, a day after weather records in several cities were broken on Saturday, the hottest day for 18 years according to the Portuguese Institute for Sea and Atmosphere (IPMA). A temperature of 46.8 C was recorded north of Lisbon on Saturday, although nowhere reached the nationwide record of 47.3 C registered in the southern village of Amareleja in 2003. Faced with the heatwave the national rail company admitted that there had been air conditioning problems on some trains and halted the sale of tickets for certain routes, especially those which cross areas where the temperatures are most ferocious. A forest fire continued to rage on two fronts in Monchique in the country´s south on Sunday, with 800 firefighters, supported by 12 water-dropping planes and helicopters were working to put it out. Saturday was the hottest day in the country since the infamous heatwave of 2003, in which thousands of mainly elderly people died. The emergency services complained that, despite public health warnings about keeping cool and hydrated, there was "still quite a lot of recklessness" -- citing the example of an elderly man in Lyon who suffered heart problems while mowing his lawn under the merciless afternoon sun. The heat has also caused air pollution levels to soar. To try to clear the air, the city of Paris has banned owners of the most polluting categories of vehicles from using their cars on Monday. In the east of the country, authorities have lowered the speed limit by 20 kilometres/hour to try dispel the smog.